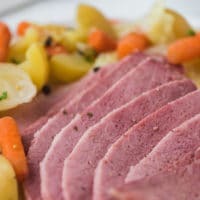 Easy Corned Beef and Cabbage Recipe With Potatoes and Carrots, cooked on the stove top in a Dutch oven. Perfect for the coming St Patrick’s Day. Place beef in a large pot (Dutch Oven), fat side up. Add the contents of the spice package. Cover with water (I usually use half water half vegetable stock). Bring to a boil. Reduce heat and simmer for 2 hours. I cook it covered with lid, leaving a small opening on top.